Grappling strength and conditioning training is a key part of training any grappling martial art. Despite BJJ people claiming that technique beats strength, they still go for strength when things don’t go as planned. Even at the highest levels of the sport, strength is a huge factor in deciding outcomes, even it is only used in a fraction of a second. The trouble with the perception of strength in Jiu-Jitsu is that people see it in black and white. They either think they do not need it at all, or they rely on it way too much. Strength and conditioning are just different aspects of the game that have their application in specific situations. It is just like with technique. There are certain points in every roll where strength does factor in significantly. However, there are different types of strength that actually have a practical use for grapplers. Getting stronger for BJJ is not as easy as just supplementing with powerlifting. Grappling strength is much more complicated than what weightlifting requires, or has to offer. Don’t get me wrong, weight lifting has a huge place in grappling strength and conditioning programs. But so do bodyweight exercises, kettlebells, Yoga and a bunch of other things. Why? because all of them bring something different to the table. Combining each of them in a program that actually works is a whole other can of worms. For now, we’ll leave them all aside and focus only on strength. Actually, we’ll focus on only one aspect of strength training that is often not included in most people’s programs. As far as strength goes, there is a dynamic and static portion to it. Going deeper into things, strength can be explosive, speed-strength, strength-speed, isometric, eccentric and so forth. Categories are not as important for today’s article, but one specific aspect of grappling strength training is. That is an isometric strength. it is an aspect of strength and conditioning that is very often taken for granted in jiu-Jitsu, despite its extremely heavy use. There are a few sports out there that rely on isometric strength more than BJJ. So, how should you go about getting your isometric strength levels through the roof? As a martial art, Brazilian Jiu-Jitsu is as much explosive and dynamic as it is static. As people get more experience and rise through the ranks, their Jiu-Jitsu game usually slows down. This is due to patience, experience and advanced conceptual applications of techniques. To that extent, the more static nature of the game means a lot more time is spent holding on to people or holding them down. This is precisely where isometric strength has a role to play. Every time we go for a hold, be it a grip, a position or a submission hold, we use our muscles isometrically. Simply put, whenever you have a muscle under tension, without subsequent movement, you’re using isometric strength. You can see why isometrics should be a big part of any grappling strength and conditioning program. They are the perfect tool to develop specific muscular endurance essential for BJJ. Working on isometric strength means you train both maximal static strength as well as improve strength endurance. This means you can hold tighter for longer, as opposed to not training. The reason is simple – isometric training recruits much more muscle fibers than dynamic training. This makes this type of strength much more reliable than others, at least in grappling terms. If there is one thing you should know about isometric strength training it are angles. If you go for an isometric squat position, for example, and you go to parallel, you’ll make your body really strong in that position. However, this newly acquired strength only extends to about 30-degree angles in both directions. Anything more than that, and you won’t have any real isometric strength benefits from that particular exercises .this is why you must do all isometric exercises at a few different angles of the same exercise. The reason we look to add isometric exercises to grappling strength training is to increase the functionality of our bodies. The more efficiently we can use our bodies in grappling exchanges, the easier they’ll be. Implementing isometric strength training into any routine is actually really easy. You can do it at the back end of BJJ class, your conditioning sessions or as a stand-alone workout. Hold times will vary from 10-20 seconds to a few minutes. Anything past 5 minutes has no real benefits and is much too time-consuming. As far as exercises go, there’s nothing better than isometric squats for grapplers. Guard retention, passing, even takedowns all require leg dexterity and strength. Especially when you need to spend a lot of time in a specific grappling position. Bodyweight squats are the best to start with, Remember to do them above parallel, at parallel and all the way down for a complete range of motion. As you progress you can progress to single leg squats or pistol squat holds. Push UpFor your upper body, you’ll need to focus on one pushing motion (horizontal) and two pulling motions. The reason for this is that we use a lot more pulling in grappling as opposed to pushing. A simple push up is going to do wonders for you if you train it isometrically. Hold it at three or four different levels, and throw in angle changes by doing incline and/or decline pushups as well. For the upper body pulls, focus on pull-ups for the vertical, and rows for the horizontal. By rows, I mean doing bodyweight inverted rows as opposed to barbell rows. The same principles apply as you’ll need to hold a pull up position at a few different points of the motion. The same goes for rows. In the case of pull-ups, in particular, try to vary the grips you have on the bar. You could (and should) also use a Gi to hang on, as this is going to develop really specific grappling strength. 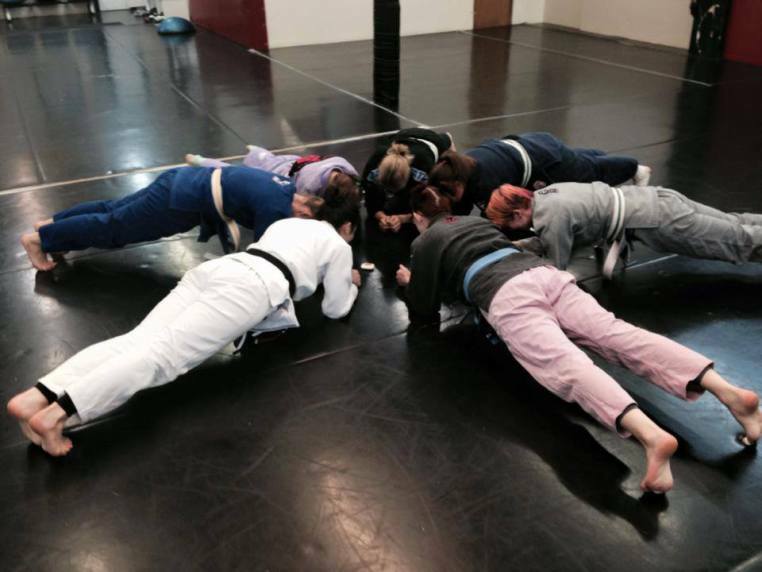 Core training is arguably the most important part of Jiu-JItsu, Our cores get a real battering in grappling and we need to focus on them in particular during strength training. For that reason, there are three stand-out exercises you can use to hit your core. One of them is probably the most well-known isometric exercise of all times – the plank. Hold planks as long as you can, and do not forget to do side planks as well as the regular one. 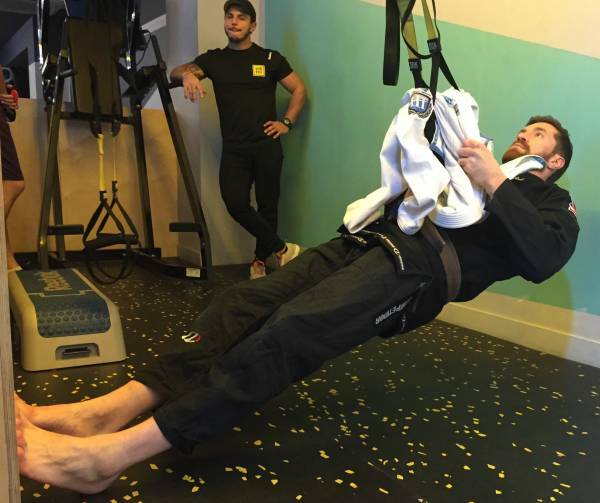 A couple of opposing gymnastics based exercises also do wonders for Jiu-Jitsu athletes. The hollow body hold and the arch hold are two invaluable exercises for developing extreme levels of isometric core strength for grappling. As a finishing touch, you can turn to some more specific grappling strength exercises. For example, get your hands on a foam roller, or a grappling dummy and go for isometric choke hold. Hold a rear naked choke, guillotine, D’arce or whatever choke you want for as long as possible. You could do the same with triangle chokes as well, conditioning your legs. A good tool to train your inner thigh muscles is a stability ball. Get it between your legs and squeeze. It is going to do wonders for your closed guard game. Get your conditioning to the next level with an easy program that combines both isometric and dynamic strength! Ethan Benda has one of the best grappling strength and conditioning programs out there. Check out his “Diamond Protocol” DVD set for a complete program and detailed exercise demonstrations.